Bryson DeChambeau of the United States raises the Dell Technologies Championship trophy on Monday after winning the FedEx Cup tournament at TPC of Boston. Bryson DeChambeau all but assured himself of a Ryder Cup debut on Monday, sealing his second straight title with a comfortable two-shot victory in the Dell Technologies Championship in Boston. DeChambeau, 24, managed six birdies in a closing round 4-under-par 67 to complete his third victory of 2018 with a 16-under-par tally at TPC Boston. The Florida-based golfer had stormed to a four-shot success in last week’s Northern Trust in New Jersey and with his Boston win has stretched his lead at the top of the FedEx Cup PlayOff series. 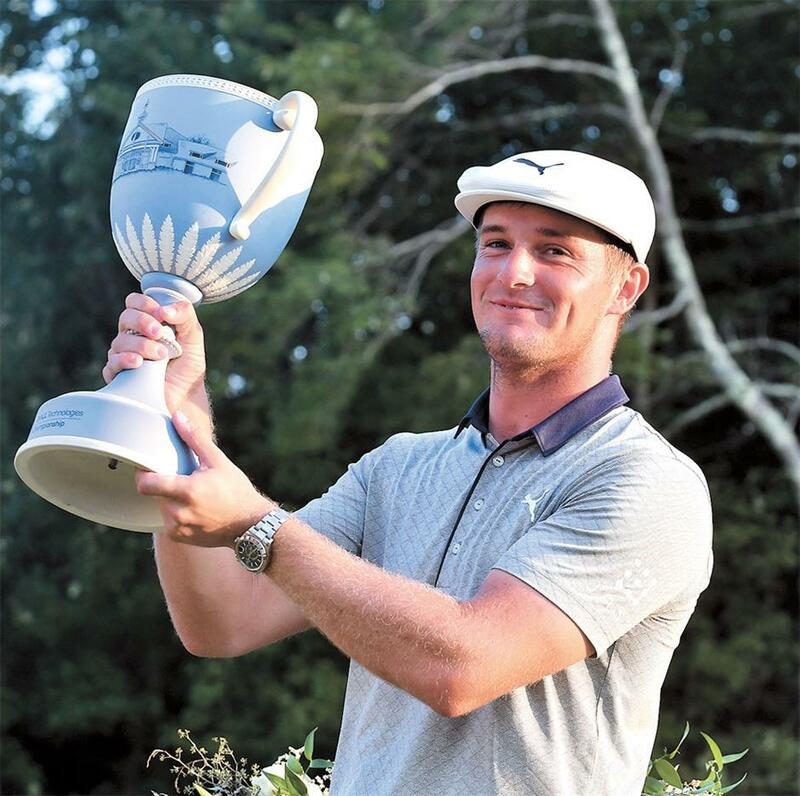 DeChambeau’s win is a third in nine Tour events while he is also the first player in 10 years to capture the opening two events of the PGA Tour’s lucrative postseason. “It’s been a fantastic two weeks,” he said. “I’ve been playing incredible golf and hopefully I can continue playing great. “Consistency has been a big thing for me. “I’ve been trying to get that week in and week out, and I was able to kind of figure something out last week on the putting green, and that’s kind of progressed me to move forward. “So, it’s all pretty cool. But now after back-to-back wins, DeChambeau can start packing his bags for this month’s showdown with Europe outside Paris. USA captain Jim Furyk still has to name three of his four wildcard picks, and after DeChambeau’s recent successes, it is unthinkable he will not be included among them. Phil Mickelson, who is also expected to earn one of Furyk’s discretionary selections, also reminded the US captain of his credentials with a magnificent closing day 63 for a 10-under-par overall total. “So fortunate also that it’s the day before the Ryder Cup picks, although I don’t feel that should be a bearing,” he said. “I think you have to look at the big picture through the course of the year statistically, what you’re looking for with that particular course or players. Not one round. Tiger Woods, whose return to form is also expected to see him named to one of the three Ryder Cup places struggled with a final-day 71 to finish at 7 under par for the tournament. Elsewhere on Monday, it was a disappointing day for Abraham Ancer, who had started the final round with a one-shot lead as he aimed to become the first Mexican player in 40 years to win a US PGA Tour title. The American-born Ancer carded a closing 73 to finish five off the lead. England’s Justin Rose took second place with a 3-under-par 68 that left him on 14 under for the tournament, one shot clear of Australia’s Cameron Smith in third. “This was an interesting week for me and it was nice to kind of sign off here in Boston,” said Rose.